A language-selection dialog is displayed the first time the camera is turned on. Press the selector up, down, left, or right to highlight items and press MENU/OK to select. Highlight a language and press MENU/OK. Press DISP/BACK to skip the current step. Any steps you skip will be displayed the next time the camera is turned on. 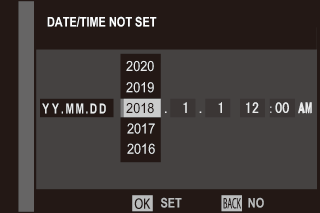 The date and time will be displayed. Press the selector left or right to highlight the year, month, day, hour, or minute and press up or down to change. To change the order in which the year, month, and day are displayed, highlight the date format and press the selector up or down. Press MENU/OK when settings are complete. If the battery is removed for an extended period, the camera clock will be reset and the language-selection dialog will be displayed when the camera is turned on. Display the setup menu and select to change the language or DATE/TIME to reset the clock. To choose a language, highlight the desired option and press MENU/OK. To set the clock, press the selector left or right to highlight the year, month, day, hour, or minute and press up or down to change, then press MENU/OK once the clock has been set to your satisfaction.